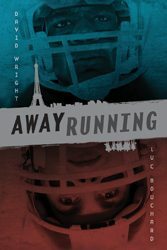 The new novel by Luc Bouchard and David Wright tackles the subject of racism and adversity faced by American football players in the early 2000s in Villeneuve, a poverty-stricken neighbourhood of Paris. Away Running also explores the rising tensions between the marginalized Parisian poor – primarily Muslims and immigrants of North African descent – and the police. The story is told through the eyes of Matt and Free, American teens who become the first two foreign players on the Diables Rouges, Villeneuve’s American football team. As the book opens, the police catch Matt, Free, and some of their French teammates trespassing. The situation escalates toward disaster, and the scene ends with a cliffhanger. The story then backtracks three months, as Bouchard and Wright fill in the events that have brought the characters to this point, narrated from the alternating perspectives of Matt and Free. Moussa (or “Moose”), the team’s captain, some of their teammates, friends, and family are also ably brought to life. Honest, amusing banter dances around the tensions between classes, religions, and races in a rich blend of slang and colloquialisms that render the teammates sympathetic and realistic. The infusion of football throughout gives the novel a framework and lexis, however the sport itself isn’t played very often. Inconsistencies with pacing and tense are also distracting. Nevertheless, the authors, who draw on true events and their own experiences playing football overseas, address complex situations and social tensions in a manner that is true-to-life and potent.